Meet Meghan and Josh, one of the cutest couples I have had the honor of photographing. I met with them earlier this year when they just happened to be in New Hampshire and after hearing all about their plans for their wedding in NYC, I knew I just had to photograph it! And, despite the weather, it was a wonderful day. The rain stopped just in time for their ceremony on the beach in Brooklyn! I love smaller weddings, and their group of family and friends crowded around them to see them become husband and wife. Plus their dog got to join them for photos after, so what could be better? Thank you, Meghan and Josh, for allowing me to be a part of your day! You both are so wonderful! Say hello to tank, the cutest hair munching pup ever! The foggy Manhattan skyline. Insert heart eyes here. The perfect backdrop for photos. Am I right or am I right? 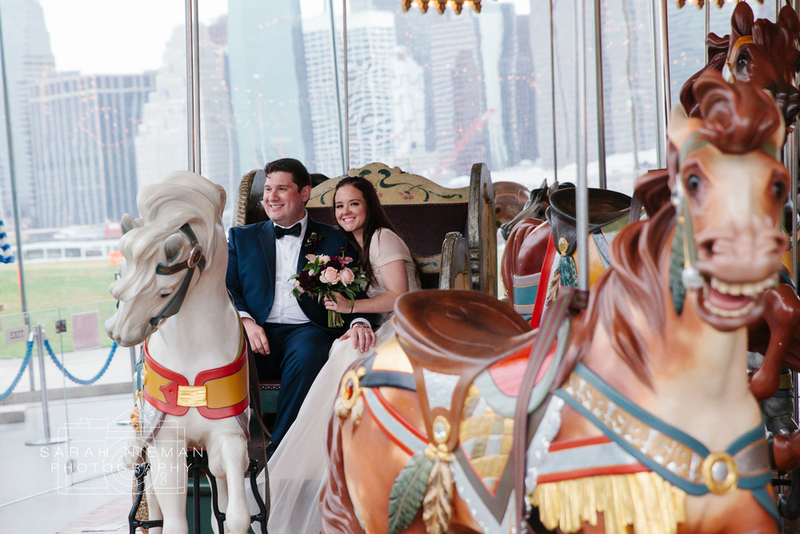 After finishing up family photos, we ventured over to the carousel! It was insanely awesome, and the perfect unique touch to add to their wedding formals.